I was looking at some of Jamie Oliver’s Cooking in Italy Food Tube videos, and really got a different perspective on cooking. 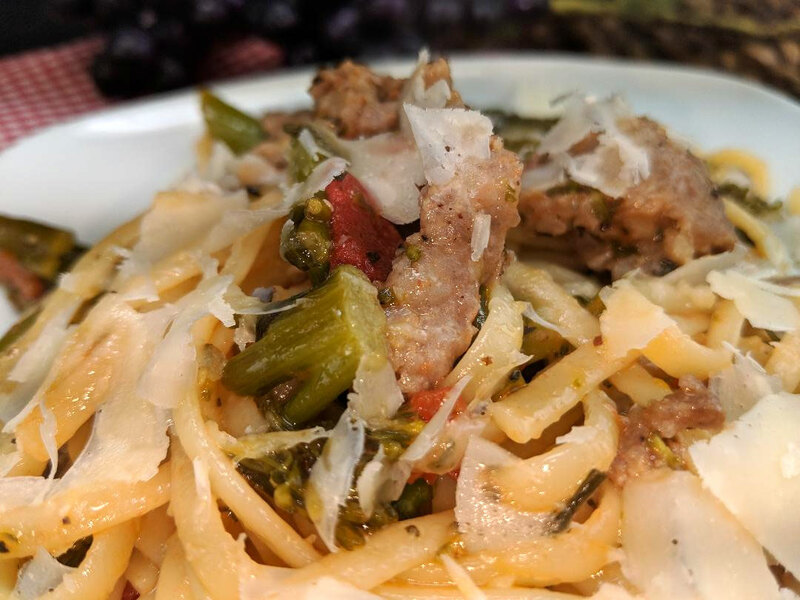 Those Italian Nonna’s take what’s on hand in their kitchen and make a great meal. In America, we find a recipe and make sure we have all the ingredients. If we don’t, we go to the grocery store and buy what we need. 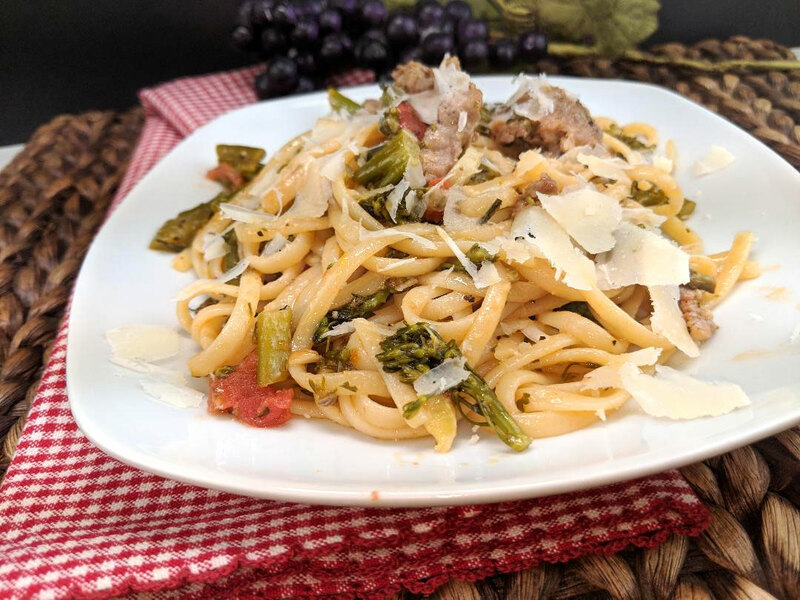 This recipe is Fettuccine with Broccoli Rabe and Sausage. The Nonna’s in Italy grew all their own vegetables and herbs, and had to work with what they had. I don’t suspect their was a grocery store close by. It is amazing, once you learn the technique. Once you have been cooking a while the technique is obvious. Throw in what you have on hand, you won’t believe how good food tastes. The only problem is, if you really love it, and don’t write it down, you may not remember to replicate the recipe. That’s why I write down my “experiments”. The experiment tonight was unbelievable. And I only took the idea from the video. In Episode 7, the Nonna’s want to show Jamie their recipes, so they are arguing who’s was best. 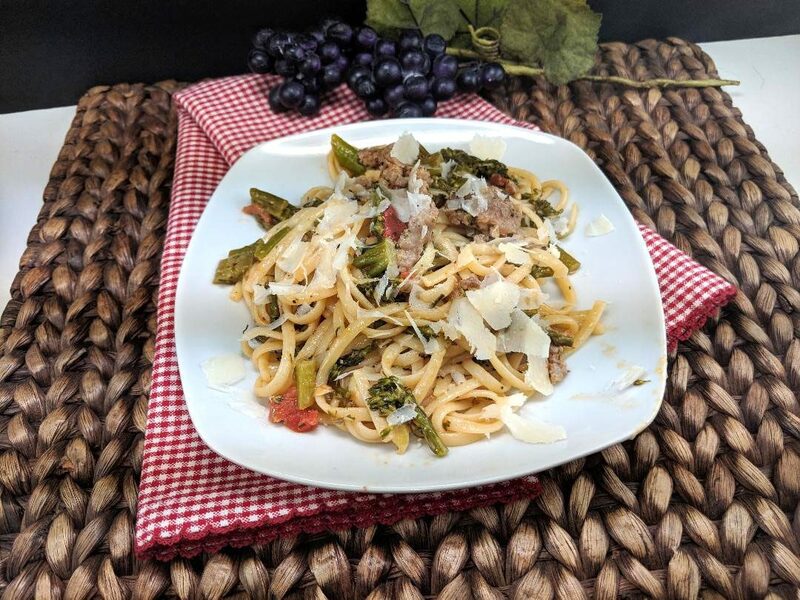 One imparticular, was a dish using Broccoli Rabe, Chili, Sausage, Wine and Linguini. 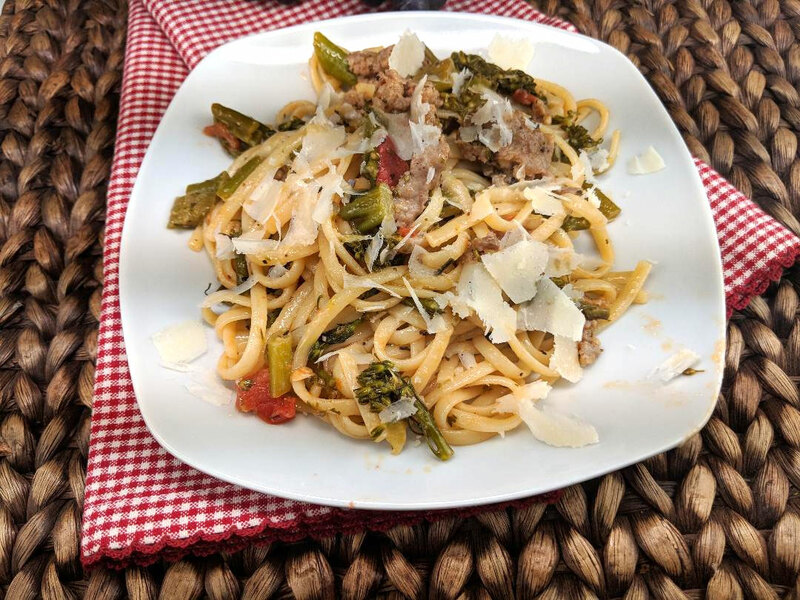 I used Broccolini, Jalapeno, Sausage, Garlic, Wine, Ripe Native Tomato and Linguini. It was delicious. Next time I would probably use a mixture of sweet and hot sausage, and eliminate the chili. I always have sausage in the freezer, but don’t necessarily always have chili’s. And I think the dish needs a little heat, so would throw in the hot sausage (although my Mom and Aunt would not agree). Take a look at Jamie’s video’s. He really has a unique and passionate way of showing how food should be prepared, which certainly makes anyone watching inspired, and want to get cooking! I learned the difference between Broccoli Rabe and Broccolini. Rabe is mostly leaves. Broccolini is tiny heads on long stems. Either way, it’s delicious. I didn’t measure anything for this dish, so measurements are approximate. 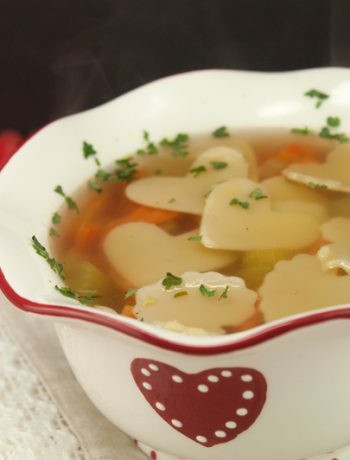 It’s really imperative you used Imported Parmesan Cheese shaved in this recipe when serving. I use this tool to shave cheese. Thank you Jamie, for your inspiration! I have made successful pizza dough, learned how to make Carbonara from Jamie, and tons of other recipes. I love videos instead of written recipes, and love all his videos. Add olive oil to a large skillet, on medium heat. Add Broccolini or Rabe. Cook to wilt slightly. Add sausage and break up with spatula. Cook slightly. Be careful not to put your light too high, so you don't burn the Broccolini. If the sausage isn't cooked all the way that's fine as it will cook more when reducing the wine. Cook on medium uncovered to reduce the wine slightly. Once reduced slightly, add butter. Add cooked fettucine to mixture and toss together. Shave Parmesan Cheese on top. Add parslet and basil, and 3 pats butter.